Bart D’Alauro of Bart and Greg’s DVD Explosion in Brunswick in 2010. 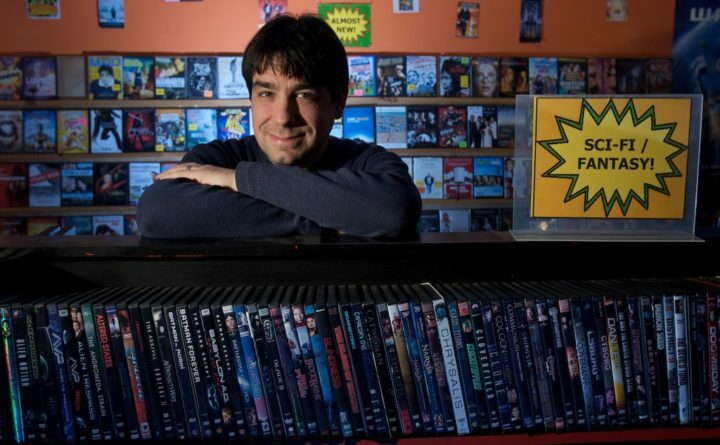 BRUNSWICK, Maine — When Bowdoin College alum Bart D’Alauro and friend Greg Morris opened a video rental shop 15 years ago, they rented only DVDs. At the time, D’Alauro said Tuesday, no one had DVD players and he had to convince customers to buy them. On Sunday, though, D’Alauro, 44, will close the doors at Bart & Greg’s DVD Explosion! for the final time. One of only a few independent DVD rental stores in Maine, the store has been another victim of the very technology that led to its initial success. While studying at Bowdoin College, D’Alauro befriended Morris when the two worked at Matt & Dave’s Video Venture in Brunswick. That store specialized in VCR movie rentals. After graduation, while D’Alauro was working in New York City, Morris called him to pitch opening the store after Matt & Dave’s Video Venture closed. “Matt & Dave’s customers would tell him all the time how much they missed Matt & Dave’s,” D’Alauro said. So he quit his job and moved back to Maine. “DVDs were at the cutting edge of technology at the time, but now technology has come back around and is closing us down,” D’Alauro said. During the store’s heyday in the mid to late 2000s, Morris, who left the store years ago, suggested that it was only a matter of time before Bart & Greg’s would fall victim to the next wave of technology. He joked in an interview with a local newspaper that he could foresee a day when movies would be transmitted directly to viewers’ brains. Technology hasn’t yet achieved that milestone. But as streaming video services such as those offered by Netflix, where another Bowdoin grad, Reed Hastings, is chief executive officer, became increasingly dominant, customer loyalty — which has fueled Bart & Greg’s in recent years — could only hold out for so long. River Bottom Video in Bath, which D’Alauro helped open, closed three months ago. D’Alauro is aware of only two other DVD rental stores in Maine: Opera House Video in Belfast and Jet Video in Portland. No longer renting DVDs at this point, the store is only open this week for customers to return discs “and pay late fees if they feel guilty,” he said. D’Alauro said he’s operated at a loss for three years, not drawing a paycheck and working a second job in a library at Bowdoin College to pay the rent at Bart & Greg’s. He’s not sure what will happen to the thousands of DVDs housed in the Tontine Mall shop, although he’s spoken to a number of libraries about whether they would want to add the Bart & Greg’s inventory, which includes many rare classic and foreign films, to their collections.